Have you ever wished that you could be making professional quality TIG welds using pulsing functionality, but you couldn't justify buying a welder with these features for roughly twice the price? 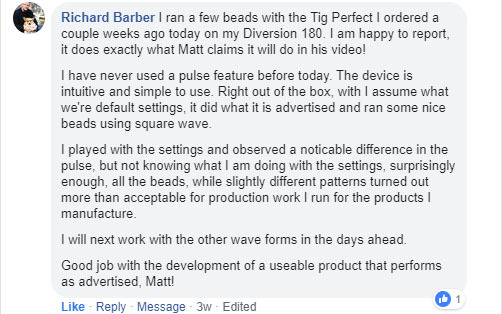 TIG Perfect is a plug and play device which gives your under-equipped TIG welder pulsing functionality at a fraction of the cost. All you do is plug the pedal into TIG Perfect, and plug TIG Perfect into the pedal port of your welding machine - now your welder has been upgraded to have pulsing functionality. Shipped complete with instructions, power adapter, and plug & play cable for your welder type. SEE WELDER COMPATIBILITY BELOW. Popular Welding Podcast Featuring TIG Perfect @ 14:30 Mark. Eastwood: Any welder that uses the 5-pin pedal connectors. Eastwood: Any welder that uses the 2-pin and 3-pin pedal connectors. These come with the 15V, 10V, and 5V Universal Kits. You can use these to adapt the TIG Perfect pulser up to a machine that we don’t offer plug & play cables for. The same weld penetration can be obtained with less power and less heat. The more heat, the more your material will warp from the welding process. This is especially important for welding sheet metal. Welders have a working duty cycle rating based on the relationship between amperage used versus time needed to wait for welder to be useable again. The less power you use, the less time the machine needs to cool down, and the more productive a user can be. Pulse features allow the user to create a uniform and reliable weld more easily. A pulsed weld is visually appealing, and gives the appearance of a perfect weld that was created by a machine. The user can go back over ugly welds that were previously made to make them look nicer.